We had a great meeting for the Pastoral Epistles study group at ETS last week, with strong attendance for four helpful papers. For our first paper we invited Fred Sanders, one of the leading systematic theologians in evangelicalism today. I had noticed a few years ago that Sanders was doing some work on the Pastorals. I contacted him and found out that he was teaching on the letters for a lay institute. He was making shrewd observations on social media, so I was intrigued to see what insight a careful theologian might bring to our question of how serious engagement of the Pastorals might impact our view of Paul. Sanders titled his paper, “Grace the Civilizer: Paul Undomesticated in the Pastoral Epistles.” He argued that the sheer oddness of the PE gives important information on Paul and that to ignore the Pastorals would be to domesticate Paul. This is a great point and well put, since the typical charge is that the PE tame down the robust Paul. However, today, people seem to shy away from embracing the claims on the PE. Sanders described the vocabulary of the PE as “a bold, missionary appropriation of Hellenistic moral vocabulary.” Focusing particularly on Titus, he highlighted the letters concern for form, beauty and order. He argued that Paul’s point was that the grace civilizes people, not merely in a bourgeois fashion leading to dull lives, but in a missional fashion leading to lives of moral beauty which honor God and attract others to the gospel. From what Paul seems to say in 2 Tim, his view of the believer’s judgment fits most easily into the “loss of rewards” category. The warnings are more than just rhetorical devices and they are for believers. There is something to lose, though reprobation is not in view. Nonetheless, Paul also reflects an inner-dynamic of the Christian life that makes it impossible to envision any acts of unfaithfulness by a believer as anything more than lapses from an otherwise progressive movement toward greater delight in Christ and service to him. Marty Feltham, who is finishing his PhD at Macquarie University in Sydney, concluded the session with his paper, “Carefully Crafted or a Clumsy Imitation? Assessing the Argument of 1 Timothy 2:1-7.” One of the things I have been particularly pleased with in our study group has been the opportunity to hear such good papers from younger scholars who are just finishing or just recently finished their doctoral work. Feltham maintained that tradition with a strong argument for the coherence of the theological argument in 1 Timothy 2:1-7 and the connection of this section with the rest of the letter. Following the argument of his recent article in Tyndale Bulletin, Feltham demonstrated that 2:5-6 was a Christological reworking of the Shema (Deut 6:4-5). Contrary to those who have long said the PE lacked anything more than clumsy theological imitation, Feltham argued that 1 Timothy 2:5-6 was a thoughtful and well-worked piece of theological argumentation “perfectly tailored to the rhetorical and polemical needs of the letter.” I thought this was a fascinating paper and I am excited to learn of one more able scholar working in the Pastoral Epistles. 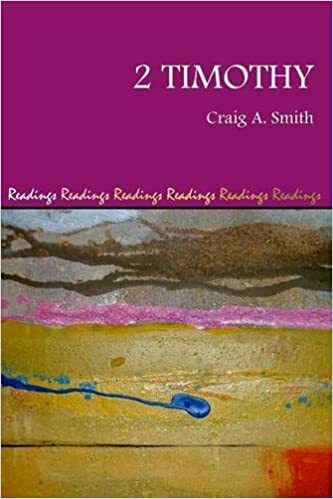 Sitting on my desk in my “to be read” pile is the recent commentary on 2 Timothy by Craig Smith in the Readings series published by Sheffield Phoenix Press. I am keen to read this commentary because I had the privilege of meeting Craig several years ago and I know of his published thesis which argues for a different take on 2 Timothy. Regarding the letter as authentically Pauline (as I do) Craig argues that 2 Timothy is not a farewell letter but an exhortation to further ministry in which Paul expects to participate. I was pleased to discover that although I have not yet gotten around to reading this book, Robert Wall has and has provided a review at Review of Biblical Literature. Wall praises Smith’s careful attention to the text and consistent methodology and argumentation. However, he critiques the lack of footnotes and what he finds as a lack of theological reflection on the contemporary meaning of this letter. I agree wholeheartedly with Wall that we must not hold apart exegesis and theological and ecclesial reflection, but, from what I know of Smith, he would also agree. Not having yet read the book myself, I will have to withhold judgment. This is a helpful review, which has nudged me to get on with reading this book. 2 Timothy written in Philippi? 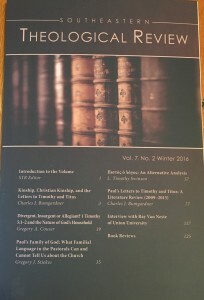 At his Patheos blog, Michael Bird recently cited a lengthy portion from Helmut Koester’s History and Literature of Early Christianity where Koester argues that 2 Timothy (which he takes as pseudonymous) was written from Philippi. After mentioning the various locations Paul refers to in the latter part of the letter, Koester states, “Any glance at a map will show that he thought of Paul as imprisoned in Philippi.” He is not mildly suggesting. See the full section at Bird’s blog. This depends on the pseudonymity of the letter, of which I am not convinced, but it is intriguing to see this argument. It would be interesting to connect this with the work of Peter Walker who has made fresh arguments for placing the PE within the chronology. Several of the papers deal with the household and family language of the Pastorals, and I found them particularly helpful. Tim Swinson challenges the typical way of understanding Paul’s use of the phrase “πιστoς ὁ λόγος.” If you’ve been reading this site, you are already aware of Bumgardner’s bibliographic grasp, and his literature review here is quite helpful. I had the privilege of doing an interview on how the Pastoral Epistles discussing how they have impacted my life, noting some ongoing work and pointing to various ways the church needs the Pastorals specifically today. Southeastern posts the full journal free online, so I expect it will appear at their website soon. Update: This issue is now available online. I have also linked the first reference to the journal above to this issue. The website provides a link to the full issue as well as to specific articles.